It’s amazing how changing the way food is presented on your plate can change the experience of eating it. simply changing the way zucchini is sliced, make as whole new dish. Word of caution: omit the almonds if you are still losing weight or on any modified profast program. Tip- Do not add almonds if you are still currently losing weight. Bring a small saucepan of water to a boil over medium-high heat. Remove the peel from lemon with a vegetable peeler, making sure not to include any white pith. (Reserve the lemon.) Cut the peel into thin slivers. Add to the boiling water and cook until soft, 4 to 5 minutes. Drain and set aside to cool. Squeeze the juice from the lemon into a small bowl. Add oil, pepper and salt and whisk to combine. Set aside. Preheat grill to medium-high. Spray with non-stick grilling spray. Grill zucchini slices, turning once, until tender, 6 to 8 minutes. 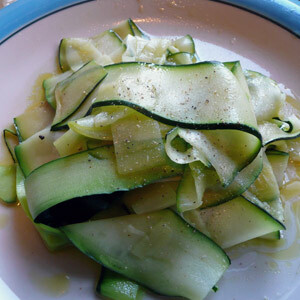 Arrange the zucchini on a platter and drizzle with the reserved lemon dressing. Serve sprinkled with almonds, cheese and the lemon peel. This entry was posted in Metabolic Medical Center Recipes, Salad, Uncategorized, Vegetables and tagged easy, fast, healthy, Salad, side dish, Vegetable, vegetarian, zucchini by foodies4mmc. Bookmark the permalink.